T.E.N.S Machine TPN 200 Plus Drug Free Pain Relief. 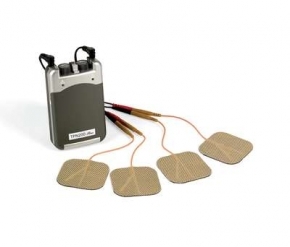 T.E.N.S technology (Transcutaneous Electrical Nerve Stimulation) is clinically proven to provide safe, drug free relief from back pain, sore joints, sporting injuries and period pain. T.E.N.S machines are designed so that you can move around with them working. You can tuck the machine into a pocket or clip it on to a belt. Before placing the electrode pads on the skin make sure the machine is switched off. Test the machine by holding the pads between the fingers and then carefully turn it on. You should feel a tingling sensation. Make sure the skin where the pads are applied is clean and dry and there are no cuts, grazes or areas of skin irritation. Place the pads either side of the pain. Use either self-adhesive pads or flexible rubber pads which should be completely covered, on the surface to be applied to the skin, with a thin layer of conductive gel. The pads should not be put within an inch (2-3 cm) of each other. Your physiotherapist or doctor will show you where to put the pads. Fix the pads to the skin with tape if you intend moving around. Set the pulse rate to the required setting (about 100 Hz is about right to start with). Switch on the machine slowly and turn it up gradually until you feel a tingling sensation. The sensation needs to be quite strong but not uncomfortable. After a few minutes the sensation will start to drop away slightly. This is called accommodation. When this happens, turn the machine up slightly and then leave it for the rest of the time in use. Do not turn it up too high, as this can cause over-stimulation which may make pain worse. There should be no muscle contraction. At the end of the session turn the machine off and disconnect the electrodes from the machine. If you intend using TENS again later there is no need to remove the electrode pads from the skin. Simply tuck the wires out of the way and carry on as normal. Check that the pads or tape do not irritate the skin. If the skin is red you may need to use a different type of pad, contact gel or tape. The machine should be used for at least 45 minutes but can be used for up to 12 hours before the electrodes need to be cleaned and re-sited. When you have finished using the machine for the day, carefully remove the pads from the skin and clean the skin with ordinary soap and water. Do not pull directly on the wires to remove the pads. If there is any redness or irritation from the pads or tape then the next time you use the machine use a different area of skin. If you use rubber pads, clean off the conducting gel with mild soap and water and rinse them well. Do not wash the self-adhesive type of pad. Do not place electrode pads on broken or damaged skin. Do not place electrode pads over the front or side of the neck, close to eyes or in the mouth. Do not use over areas of reduced sensation. Do not use near water such as in the bath or shower. Do not use when driving or operating machinery. When the cause of the pain is not known or is not diagnosed. Pregnancy (unless specifically medically advised - or in labour). If you have a Pacemaker. Epilepsy or certain types of heart disease. Supplied complete with leads, self adhesive electrodes, 1×9V battery and TENS user guide in soft carry case.